second body easily on his hip with his Cotton Carrier. I don't claim to be an expert on wedding photography, but when I do come across an interesting story to follow, I think it's worthwhile to share with everyone. My friend John Roberts from JR Photography was given the green light by one of his clients to shoot their entire wedding on the rangefinder like Olympus pen. An experienced wedding photographer, he convinced his clients that he would use his collection of legendary rangefinder lenses to shoot their wedding (Voigtlander and Carl Zeiss lenses). With additional support by the local Olympus rep, his equipment was topped up with additional bodies, lenses and wireless flash systems. multiple flashes in one case. I popped down to catch some shots of him working. The immediate thing I noticed was how compact his entire set-up. Considering in the past when I've done other event shoots and weddings, I usually had a trunk load of bags full of lighting equipment and camera bodies. 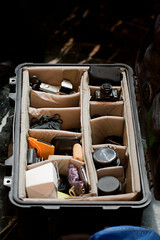 The fact that his entire set-up fit in his single roller case is a testament of shooting with this combination of gear. Now I must also admit that using a compact non-SLR system seems a bit risky, but in the hands of an experienced shooter, why not. There have been many cases of professionals who have had to rely on their point and shoot back-ups because their primary or secondary camera SLR bodies failed for some reason or another. Of course it's all about the pictures and not about what system you use. 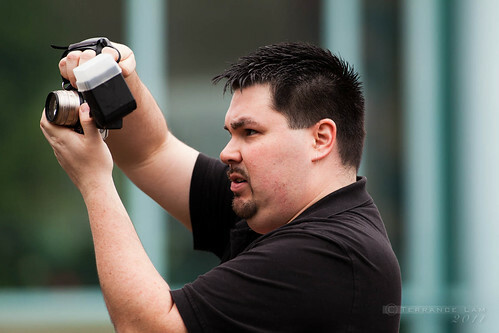 Ironically, one of the groomsman had his Canon 1Ds Mark III bodies with a 70-200 F/2.8 lens and Speedlite - a system that together is easily over $10,000. It kind of seemed odd to see a roll reversal where normally I see the wedding photographer with the most expensive kit, while guests and wedding party with point and shoots. What John had in his case was probably easily less than half of what that groomsman had in a single lens and camera body. Part of John's experience is being a medium format shooter, so it helps with trying to use a live viewfinder to shoot at arms length. There's some advantages of shooting in this way as it's much easier to get your camera in angles that aren't as easy to do with a traditional SLR system. The Olympus Pen system also supports Olympus' wireless flash system which extends the creative flexibility and lighting options of this compact Micro Four Thirds system. 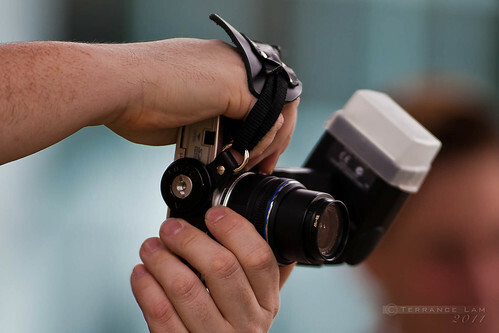 These flashes are the same flashes that are found on their professional dSLR E3 and E5 cameras. I'm not going to say if this is the most ideal system to shoot weddings with, however John's vast experience in wedding photography is what makes this an ideal system for him. There are certain advantages that you'll still find in a traditional SLR system, but there's no denying that all the creative reasons to use a larger system are within this compact body–so why not? 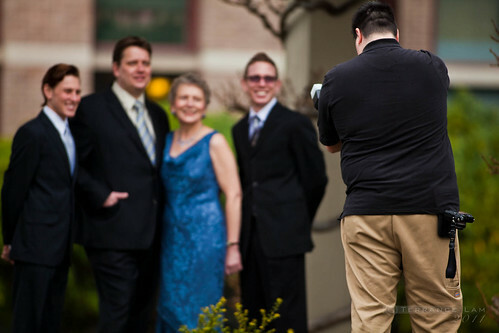 One thing is certain, this shows that you don't have to have a complex system for wedding photography. Compact mirror-less systems like the Olympus Pen are certainly intriguing and simplifies things. For the cost of a couple of thousand dollars, it is easy to build a very nice system that can do events and weddings. For more information on the progress of John and his Olympus journey, follow his blog postings here. Great blog post my friend. Thank you for coming along with my adventure today. You're welcome John. Always nice to see people pioneer and push beyond what people consider as the industry standard. It just further proves the point that when it comes to great photography it's about the photographer, not the camera. I'd love to hear the photographer's assessment of this experiment. Give it a read and thank you for reading. Well done Terrance for documenting John's experiment with the Olympus E-PL2. You and John each offer great insight in your posts. 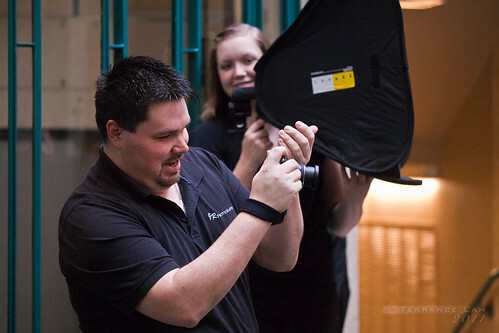 Looks like you got some great action shots of John working his magic as well! A skilled photographer can do wonder with ordinary camera. I saw a post on fstoppers once, where a portrait session was done with an Iphone, I guess its good to try out these things. if you are skilled at your craft then you can work with almost "anything". Might try shooting a wedding with me phone, wouldn't dare if I was getting paid though.